A laser printer that knows how to print well and fast and comes with easy maintenance, that is Brother HL 2132 in a nutshell. It is an entry level machines, but the results are at par with some pricier machines also. 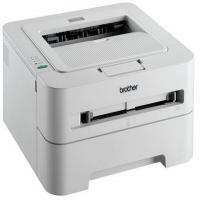 Brother HL2132 is a compact machine with a maximum print resolution of up to 1200 x 1200 dpi. The printer works at an optimum speed of 20 ppm with a fast first copy out of less than 10 seconds. The print quality is sharp and crisp, even the solids are well reproduced and with no loss in resolution. No blurry or jagged edges are seen and the grayscale is also well tackled. The large feeder tray can handle 250 pages at maximum capacity, which is substantially higher than many of Brother HL2132’s rivals. The Brother HL2132 Toner Cartridges is separate from the drum. Both together give a moderately high printing cost, but that's resolvable its compatible cartridges. The drum comes with a life of 12000 pages and the cartridges print up to 1000 pages. Brother HL2132 is a good performer which gives crisp and clear printouts compared to similarly priced contemporaries. It has a neat design and an easy to maintain mechanism. The ample storage and multipurpose feeding capability add to the allure. A simple, cheap, good quality and fast laser printer. What more would a normal home user or small office guy ask for? That's the Brother HL2132 for you. It is a low cost and good quality option for anyone looking for a standalone laser printer. The Brother HL2132 printer offers features that work great for home and small office users. The company supplies a set of Brother HL2132 Toner Cartridges with the purchase and once the cartridges get consumed you can purchase new ones online. But often print quality issues arise during the print jobs. Print quality issues such as banded prints, faded prints, dark prints, toner marks along the pages or no prints are very common. While most of the times these issues may be caused due to the Brother HL2132 Toner Cartridges being consumed by the printer, the cause may also be due to the printer settings. Merely changing the settings or replacing the cartridge solves the issue. You need to check the drum unit of your Brother HL2132 printer. There is a possibility that the drum unit may have been damaged. You are required to replace the damaged unit with a new one. While you check the drum unit for possible damages, check the Brother HL2132 Toner Cartridge for damage as well. If the toner cartridge undergoes any damage, the toner leaks and marks the pages with smudges. You will have to remove the toner cartridge and then clean the internal space with a dry cotton cloth. Replace the old damaged drum unit with a new one. Use a quality paper for printing and make sure that the paper quality matches the media settings in your system. Never use a stapled paper or a paper that has pins. The staple pins and other such sharp metal objects scratch the drum unit and damage it thus leading to print quality issues. Whenever you replace the drum unit pay attention that it should not be exposed to a source of direct light. Direct light or sunlight damage the drum unit. Q. Can I use Brother HL2132 toner cartridges for Brother DCP 7057 printer as well? If I can, will the printouts be clear and good enough? A. Yes, you can use these toner cartridges with the Brother DCP 7057 printer. The quality of printouts this printer yields is as good as they are in other printers they are compatible with, including Brother HL2132 toner cartridges. Q. Do Brother HL2132 toner cartridges print in colour also besides black? A. No, these Brother toner cartridges print only in black. Q. If the toner powder from an old cartridge gets mixed with that of new cartridges, will there be an issue while printing? A. Yes, please ensure that the toner powders of both do not get mixed. The properties of old and new powder are markedly different. The texture of the mixed powder tends to result in clustering due to which the process of printing doesn’t proceed smoothly and affects the output. Q. A colleague told me that I will be able to print faster with Brother HL2132 toner cartridges in my Brother HL2132 printer. Is that really so? A. Yes, you can print faster with these toner cartridges as the components used to manufacture them are equipped with superior features that boost printing speed. Q. I want to return toner cartridges purchased from you as it’s a wrong order from my end and I need another model, which I shall order soon. Will you deduct a huge amount for this oversight? I’ve had an unpleasant experience with another seller previously and don’t want a repeat. A. We assure you of a smooth, hassle-free returns service on any product you purchase from us. All you have to do is contact us within 30 days of the purchase and return the item in its original, unopened packaging. We just need to deduct 10% of the restocking charge, which is a basic charge and unavoidable for us. Q. If I buy compatible Brother HL2132 toner cartridges in a pack of two, how many pages will I be able to print with both? Will I save more with these cartridges or with genuine ones? A. You can print up to 2,000 pages with both the toner cartridges together. Compatible toner cartridges are priced cheaper compared to their original counterparts and very often, yield more number of printouts, which makes them more cost-effective. Q. I need to replace Brother HL2132 toner cartridges. Should I power down the printer before starting the process? A. Yes, powering down the printer before starting the replacement process is recommended. Q. I need deep black text output for the documents I need to print for clients. Will Brother HL2132 toner cartridges (compatible) be useful for me? A. Yes, the compatible version of this toner cartridge will get your printer to produce text in the deepest black shade that you expect from their genuine counterparts. You can go ahead with them as they are just perfect for you. Q. If I’m not satisfied with Brother HL2132 toner cartridges after purchasing them, will I be entitled to free returns support upon sending them back? Is the money back guarantee alternative also provided?? A. Yes, most sellers of these toner cartridges offer options like free returns in case a customer wants to return them. In addition to that, a money back guarantee is also provided on purchase of these toner cartridges so you can rest assured that your entire amount will be refunded to you. Q. I keep hearing that compatible toner cartridges are more economical and yield more pages than original toner cartridges. Is that true? A. Yes, compatible toner cartridges are on par with the original ones in virtually every way, be it in terms of output quality, performance and cost-effectiveness. In fact, using compatible toner cartridges helps you save more than you would with the original ones. Q. Can you tell me how can I replace the Brother HL2132 Toner Cartridges and what are the things to remember before replacing them? DO NOT use flammable substances, any type of spray or any organic solvent/liquids containing alcohol or ammonia to clean the inside or outside of the printer. Doing this may cause a fire or electrical shock. We recommend that you place the drum unit and Brother HL 2132 Toner Cartridge assembly on a clean, flat surface with a piece of disposable paper underneath it in case you accidentally spill or scatter toner. To prevent damage to the machine from static electricity, DO NOT touch the electrodes inside the machine. DO NOT unpack a spare Brother HL 2132 Toner Cartridge and drum unit until immediately before you put it into the machine. If toner cartridges are left unpacked for a long time the toner life may be shortened. While removing the drum unit, handle it carefully because it may contain toner. Open the front cover and take out the drum unit and toner cartridge assembly. Put the new toner cartridge firmly into the drum unit until you hear it lock into place. If you put it in properly, the green lock lever will lift automatically. Clean the primary corona wire inside the drum unit by gently sliding the green tab from right to left and left to right several times. Put the drum unit and Brother HL2132 Toner Cartridge assembly back into the machine. Close the front cover. Note: DO NOT turn off the machine's power switch or open the front cover until the Ready LED lights up. Q. My Brother HL2132 printer displays offline how to fix it (It is connected to Windows PC)? A. Before you proceed check if you are able to print from your PC. If yes then try following troubleshoot to resolve the issue. Verify the Status Monitor is displaying or monitoring the correct Brother machine. Check the printer drivers install in your and make sure they are of the same printer model that you are having issues with. If your Brother printer can not be found in the printer list on Status Monitor, install the drivers for this printer. Go to Brother site, search your printer model and download driver for you Windows PC. Verify the "Device to Monitor" setting. Right click the Status Monitor on the task tray, and then click Device to Monitor. The installed Brother printer drivers will be listed. If you have multiple Brother printers or installed the driver multiple times, the multiple drivers will be listed. If some other printer is selected in the Device to Display setting of the Status Monitor, find you printer in the list and select it. Click OK. You will get immediate notification of errors such as paper empty, paper jam or ink empty. Verify the status displayed on the Status Monitor. Check the status displayed on the Status Monitor. If it is still displaying printer Offline, restart the Status Monitor and check the status again. If the Offline status is still there, go to the next step. It might be possible that the Status Monitor program has the issue. Download the Full driver and software package from Brother site and reinstall those on your PC.